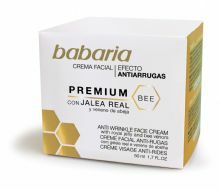 Babaria Aloe Vera anti wrinkle cream designed to be used twice daily, this remarkable moisturiser helps restore and improve the quality of skin tissue. Exploiting an exceptional synergy of plant ingredients with a specific regenerating and toning action (20% Aloe Vera), it is recommended for tired and toneless skin, restoring optimum elasticity and freshness day after day. Used regularly, it strengthens tissues, smooth’s creases and eliminates the outward signs of fatigue, giving facial skin compactness and firmness. 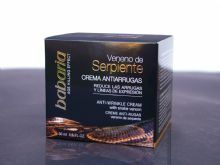 • Contains Hyaluronic Acid which is one of the best natural moisturising components used in cosmetics today. • Aloe Vera is absorbed into the skin more easily than water leaving it hydrated. • Glycerine helps the skin to retain moisture keeping it smooth and supple. • Skin looks visibly younger. Aqua (Water), Aloe Barbadensis Leaf Extract (puro Aloe Vera 20%), Octyldodecanol, Stearyi Alcohol, Cyclopentasiloxane, Ethylhexyl Methoxycinnamate, Glycerin, Polyacrylamide, Prunus Amygdalus Duicis Oil, Cetyl Alcoho(, Ceteareth-1 2, Ceteareth-2 0, Cl 3-1 4 isoparaffin, Sodium Ascorbyl Phosphate, Tocopheyi Acetate, Sodium Hyaluronate, Phenoxyethanoi, Ascorbic Acid, Laureth-7, Parfum (Fragrance), Methylparaben, Tetrasodium EDTA, Citric Acid, Propylparaben, 2-Bromo-2-Nitropropane-1, 3-Dial, Butylparaben, Ethylparaben, ,2-Hexanediol, Capryly1 Glycol, Potassium Sorbate, Sodium Benzoate, Sodium Sulfite.